The 220MW Bungala solar farm – Australia’s largest – begins production, signalling a milestone for the transformation of Port Augusta into a renewable energy hub. Artist’s impression of the Bungala solar farm. Australia’s biggest solar farm – the 220MW (AC) Bungala solar project near Port Augusta in South Australia – has begun production marking the important first stage of the transformation of a former coal city into a major renewable energy hub. The first output from Bungala – which could end up being a 300MW project if all three stages are built – was injected into the local grid last week, as final commissioning of the 110MW first stage continues. Bungala, located 12kms from Port Augusta, is one of a number of major renewable projects being built, or about to start construction, near the city which once hosted the state’s two brown coal generators. Near Bungala, the 212MW Lincoln Gap wind farm, along with at least 10MW of battery storage, is under construction, and the 150MW Aurora solar tower, with 8 hours of molten salt storage, should start construction later this year about 30kms north of the town. Bungala is owned by Italian energy giant Enel Green Power, along with the Dutch Infrastructure Fund, and has signed a power purchase agreement with Origin Energy. “Once completed, the overall Bungala Solar facility will be able to generate around 570 GWh per year, equivalent to the energy consumption needs of approximately 82,000 Australian households, while avoiding the emission of over 520,000 tonnes of CO2 into the atmosphere,’ the company said in a statement last year. The first two stages of the project was bought from Reach Solar Energy, a company established by Tony Concannon, the former boss of the now closed Hazelwood brown coal generator in Victoria. The first two stages are expected to be completed early next year. Reach Energy still retains the rights over the last 80MW of the facility, and the company is still working to put that part of the deal together. The arrival of the Bungala solar farm is a significant development for South Australia, which already sources more than 50 per cent of local generation from 1800MW of wind farms, and more than 830MW of rooftop solar. It will likely help change the profile of production in the state, and possibly help address some of the day-time reductions in output than can sometimes afflict wind energy, particularly in heatwaves. So far, only two small solar farms have been opened in South Australia – the 4.9MW facility in Peterborough, and a 6.6MW facility in Whyalla. Many more are planned, including the 107MW Tailem Bend solar farm, and a 44MW solar facility near Snowtown. This will be the first to appear as large scale solar in the popular NEM-Watch widget that shows live generation on our website. Nearly a dozen solar farms have recently, or are about to, connect to the grid in NSW, Victoria and Queensland, with the 100MW Clare solar farm beginning production in north Queensland in the last few days, and the Hughenden solar farm also connecting. Storage is also changing the nature of the local grid, with the success of the Tesla big battery near the Hornsdale wind farm, and new storage facilities planned for Wattle Point, Lincoln Gap, Snowtown, and Whyalla. Pumped hydro is also being investigated. The steel-belt towns of Port Augusta, Whyalla and Port Pirie will become a major centre of renewables, with Sanjeev Gupta planning 1GW of solar and storage to help power the local steel works, and DP Enegy also progressing on its major wind and solar project. The former Labor government had a target of 75 per cent renewable energy by 2025, but it is likely the state will reach that target- possibly as early as 2021 – given the number of new projects being built, and despite the election of a Liberal government that did not support such state initiatives. However, the opening of the new solar farm, along with the other projects, should please new energy minister Dan van Holst Pellekaan. He is the local member for the Port Augusta region. Local media reported that a worker died at the site of the solar farm in February, reportedly pinned by machinery. It’s a great month for renewables. Bungala, Longreach, Manildra, and Clare – four solar projects have started generation in the last week or so. So too have Silverton and Sapphire wind farms. Every month is a good one for RE. Its just a shame we have those coal tossers in Canberra playing roadblocks trying their best to slow the RE train down. But they can’t stop it, not when individual businesses are getting on board…just follow the money train. The deeper impact of all this is that these tossers achieved the neoliberal agenda to either privatise public goods or destroy them. The grid as we knew it, and as public asset no linger is. It has been flogged to death… what the defectors; they might still be connected, but not much will happen. Actually lucky we sold the old assets when we did. Because pretty soon they are going to be worthless. Vic did really well out of the electricity privatisations. Consumers of electricity didn’t. But ironically that has probably sped up the transition. One dead in solar farm accident! That makes solar about five times more dangerous than those damned pink batt fiascos! But to balance the picture a little, the article went on to say that, “In 2016, construction had the third highest number of workplace fatalities, behind transport, agriculture and farming.” Must have been that phantom beetrooter again! Some compassion for the poor persons death and his/her Family would have been a more appropriate response! Looking foreword to the effect these commercial sized solar farms have on the South Australian grid. The % renewables will be pushing the limits of what has been achieved so far without hydro power. When will it be added to the widget? Somebody, somebody. 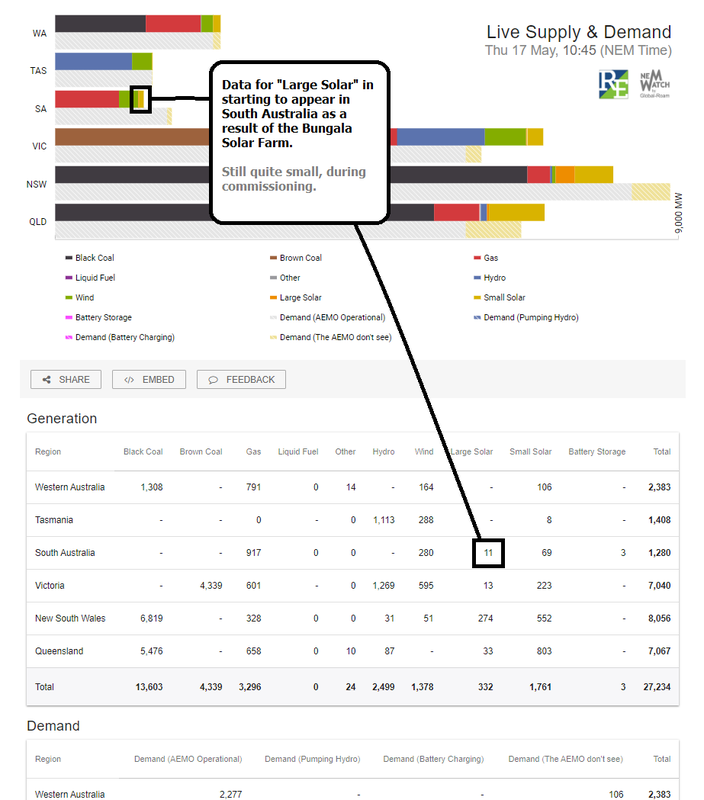 Sorry can’t see large scale solar bar for SA in any article on the graph. Great news for S.A. …….Lets go the whole hog…..100% or nothing! Anybody have some stats on this project that I would be keen to know?
. how much does it cost to start up a coal mine that would produce the same quantity of power and how much land would it need to provide that coal? any one know? It would make great debating points!